In 2008, Washington State had only two well-known Vaux’s Swift migratory communal roost sites, and barely known is probably more accurate. One of the first American structures that greeted Canadians entering at Sumas was the Old Customs House. Large numbers of swifts had been seen entering its brick chimney as early as the 1950s, especially in the spring. In 1991 a successful effort was made to save this building from the wrecking ball. Success was assured by the National Historic Preservation Act, but the birds were also a factor. Enjoy the riveting story as told by the Sumas Astonisher. The second site belongs to the Monroe School District. In the middle of town sits a snazzy 1930s brick schoolhouse. 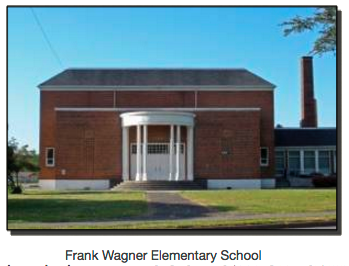 Its name honors Frank Wagner, whoever he was. It also has a 4x4 foot slightly tapered brick chimney that extends 25 feet through the school’s flat roof. It’s not the largest chimney around, but for the swifts, it’s a comfy five star accommodation. One local citizen claims knowing about the swifts for 40 years, but the birding community wasn’t aware on this avian spectacle until the fall of 2004, when a few posts surfaced on Tweeters. 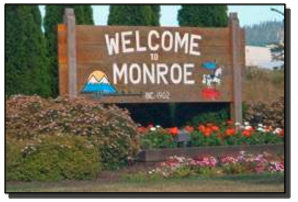 As of July 2008, the majority of Monroe town folk have no idea that they have a twice-yearly bird invasion. Audubon is working hard to change that. The problem is that the building is old and functional, but the chimney isn’t, and a brick storm at recess could be a fatal event. Better tear that thing down. Audubon quickly launched operation S.O.S. = SAVE OUR SWIFTS. The Monroe School District’s response to these mostly outside bird lovers was, well, actually, extremely positive. In March the Everett Herald came out with an article about the unfolding drama. But if the Wagner chimney is torn down, surely the birds will just go down the street to some other chimney. Won’t they? Vaux’s Happening would document just how significant and important Monroe was to migrating swifts statewide. Long before the last bird was counted, Monroe’s significance was obvious. Of the 183,463 documented Washington State Spring 08 Vaux’s Swift chimney encounters, a stunning 74% occurred in Monroe. The May 7 high count of over 21,000 had to be a standing room only evening for the little birds, and probably doomed the shorten-the-chimney option. What is it about Monroe’s Wagner Elementary School Chimney that makes it so attractive? A nice clear approach to the chimney entrance may be a part of it, but as every real estate agent is fond of saying, it’s location, location, and location. 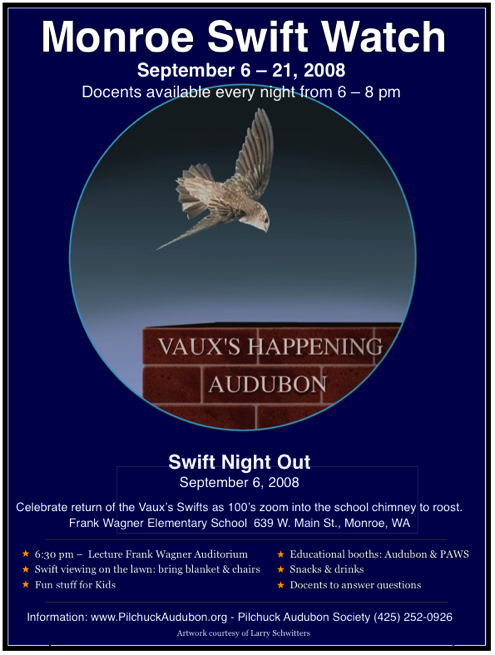 Monroe's "Swift Night Out" has been an annual event since Vaux's Happening introduced it in 2008 to draw attention to the significance of the chimney. Visit the Monroe Swifts! website for more information.